Glazed Tile refers to any tile that has a "FIRED" glaze on its face. This usually looks like an enamel painted on a white or tan tile body, then baked at high temperature. For metallic glazes, see below. Edge view - beige clay body (bisque) with a white kiln fired glaze. Colors, textures, designs available are an enormous selection. Metallic glazes look like iron, copper, brass, etc. True metal tiles are discussed on another page. You would not be sealing the tile unless it had some unusual characteristic, like sealing pinholes, helping color, etc. Some glazes are actually a little absorbent and will therefore stain. These can be sealed. Normally, you will only be sealing the grout. See below. Usually does not need to be sealed. But, the grout does need to be sealed. Cleaning with vinegar. This is a very weak acid and works fine, except for its tendency to leave an opalescent film. If there is concern for grout residue problems due to tile texture (or finish as with matte type glazes), then keep grout residue out of any surface texture characteristics by coating with Aldon Grout Easy before grouting. "Grout Easy" is a water soluble coating that comes off easily while grout is being cleaned up with water and a sponge. Efflorescence (subsurface originating white powdery stains) can occur in the grout. However, it is easily cleaned. 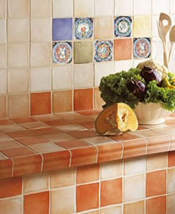 Grout colors can "fade". The appearance of fading is actually from light efflorescence and can be stopped by sealing with the appropriate Aldon sealer. Some glazes could scratch during installation, however, one of the "solvent-penetrating" sealers tends to make the scratches disappear on some finishes. Test a sample first. Metallic glazes: These can look like solid metal all the way through, but in reality are a kiln fired coating on a clay body. Many of these are absorbent and therefore can be stained. Test absorbency with water drops and consider testing Aldon S-B-S Sealer as a way to protect the finish and also enhance the metallic coloring. #2. If the Glazed Tile is installed but grout is not sealed. #3. If the grout has been sealed in the past. Generally, glazed tile do not need to be sealed. Only the grout needs to be sealed. However, the exceptions would be those glazes that have a slight degree of absorption (they will stain), or those occasions where some tile in the batch are less glossy than others. See below. "Same Day Sealer" on Glazed Tile. This sealer is Water Base | Penetrating Type. Provides: No color enhancement or gloss. Coverage guidelines (depending on absorption) 250 to 600 sq.ft./gal. When sealing the grout only. 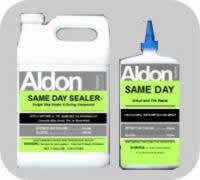 "Same Day Sealer" is for when you are sealing only the grout. It does not have any effect on color or create any gloss. The quart size has an applicator tip for grout joints. Any slop over to the tile face is easily wiped away as you progress. 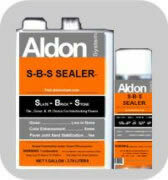 "S-B-S Sealer" on Glazed Tile. This sealer is | Solvent Base | Penetrating Type. Provides: color enhancement | low gloss | strengthening | efflorescence barrier. Coverage guidelines (depending on absorption) 150 to 500 sq.ft./gal. S-B-S Sealer is a low solids sealer that creates some color enhancement and an easier to clean surface. This would be the sealer to use when you are sealing the tile and the grout at the same time. 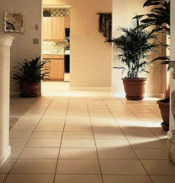 Easy Care Products: for a Glazed Tile floor or wall. "Maintain" - for no streak wet mopping of Glazed Tile and all other types of flooring. You may have heard of concerns about Glazed Tiles. All of them would be prevented with the information we provide here. Therefore, you can have the floor you want!